You may not realize it, but your blog niche plays a huge role in your blog’s success. It’ll help you determine who your audience is, which blog post ideas to focus on and which products you need to create. Most importantly, it’ll help you maintain focus as you plan out your editorial schedule and overall business and marketing strategies. In this post, we’re going to go over what a blogging niche is, why your blog needs one and the steps you can take to find yours. We’ll then go over the steps you should take upon finding your niche as it’ll unlock a number of different tasks for you to tackle. Let’s get started. 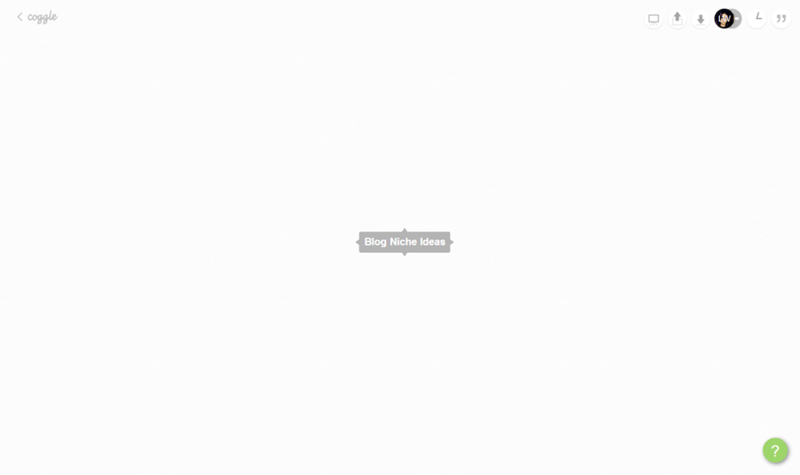 What is a Blog Niche? Denoting or relating to products, services, or interests that appeal to a small, specialized section of the population. A key phrase to note here is “specialized section.” A niche is a specialized section of a broad topic. For example, “sports” is a broad topic while “basketball” and “baseball” are niches within that broad topic. You can even get more specific and call the “National Basketball Association” and “Major League Baseball” niches. So, what is a blog niche? A blogging niche is the overarching topic your blog focuses on. 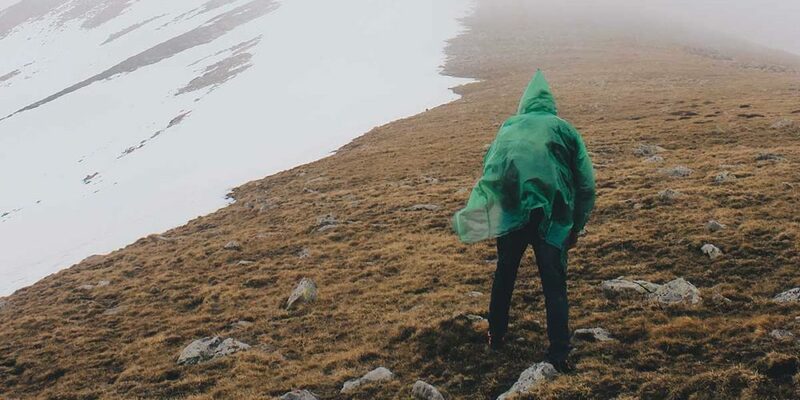 It’s an umbrella category every blog post you publish can fall under. It represents the niche market and audience your blog targets. You’re not blogging for “basketball fans,” a broad audience. You’re blogging for “NBA fans,” a niche audience. Why Does Your Blog Need a Niche? The reasons why your blog needs a niche are simple, and we’ve already named the majority of them. It’s extremely difficult to see increases in traffic, search engine rankings, affiliate sales and product sales when you target a broad audience, for starters. There may be a number of different sites who do that in the mainstream, and you’re not going to be able to compete with them as a new blog. Targeting a broad audience is also bad for engagement. For example, if you blog about a broad topic, such as “how to make your own clothes,” you may wind up attracting an audience of people who want to learn how to sew. So, when you decide to focus on knitting for a few posts, you may be baffled by the amount of low traffic these posts receive despite your site getting hit with tons of traffic on your sewing posts. You need to pick a blogging niche that will help you target a specific audience. It’ll help you determine the specific problems that niche market is having, which will prevent you from wasting time on posts that won’t receive traffic. This all boils down to product creation. Being able to learn about the specific problems members of your niche are having will help you come up with a few product ideas to solve those problems. With that said, let’s get into the steps you can take to find your blogging niche. According to a number of different websites and experts, including The Balance Small Business and Jeff Lenney, some of the most profitable niches include the following. Some of these are linked to an example blog in that category. All of these niches have one thing in common—they’re all broad and highly competitive, making them unsuitable for new blogs. If you’re interested in starting a blog in one of these niches, you need to break them down, and find a specialized topic that’s non-competitive and profitable. I’m going to go through these steps with the assumption that you do not have a blog and aren’t sure what you want to start a blog about. However, these steps can also be improvised to help current bloggers and those who have a few blog ideas “niche down” on their blog topics. After all is said and done, you’ll have one or a few niche market ideas to choose from based on your interests, what you know and how likely you are to make a profit. Let’s get started. I’m going to use a mind-mapping tool called Coggle for the purposes of this tutorial. It’s a great tool that allows you to create three private diagrams and unlimited public diagrams free of charge. It’s a wonderful tool to use to keep track of all of the ideas you’ll be coming up with and discovering. You can also use a regular Google/Word document or spreadsheet, if you wish. If you hover over each side of this bubble, you’ll notice a few plus signs appear. 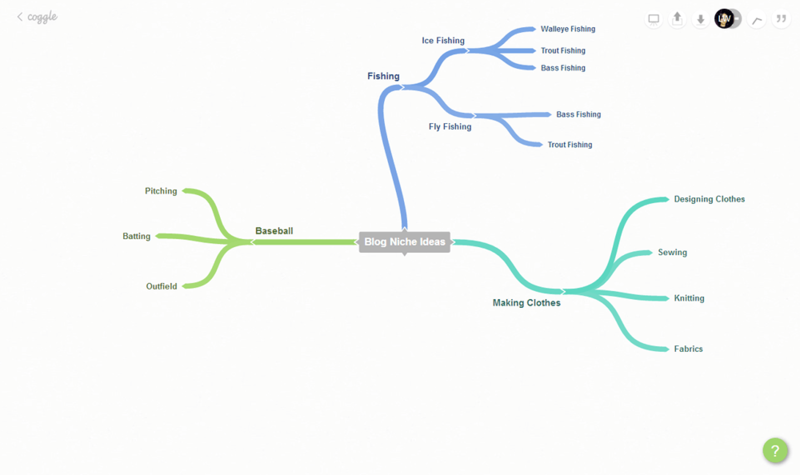 These allow you to create parent branches in your mind map. We’re going to use them to list the broad topics we’re interested in. Think of your passions, hobbies and general interests, and create a new parent branch for each of them. Add as many as you like, just make sure you’re only adding broad topics at this stage. Next, start adding child branches by thinking of more specific topics based on what you know best. Writing what you know rather than simply chasing a niche you know nothing about because it seems profitable is a much better way to guarantee success. This is true for a number of different reasons. For starters, your success has a blogger relies greatly on how much valuable content you’re able to produce. You don’t necessarily need to post everyday, but you do need to publish several posts a month to stay on the radars of readers and search engines. If you aren’t interested in the topic your blogging niche is about, you’ll be less likely to make time to learn about it enough to publish new posts on a regular basis. Next, readers want their problems solved, and what better way to show them you understand the struggles they’re going through than to admit you’ve been through them, too? Blogging about what you know will allow you to relate to your readers and form a connection with them. So, in Coggle, start adding child branches based on a few specific topics you’re knowledgeable in for each of your broad topics. You don’t need to be an expert in these topics. You simply need to know more than someone else. If one of your broad topics is “baseball” and you only know the rules and basic mechanics of the game, that’s fine. You still know more than someone else. One other thing to consider is whether or not your blog niche idea can be made into an entire blog. What I mean is, can you come up with an entire year’s worth of blog posts for this topic? Take that into consideration as well. 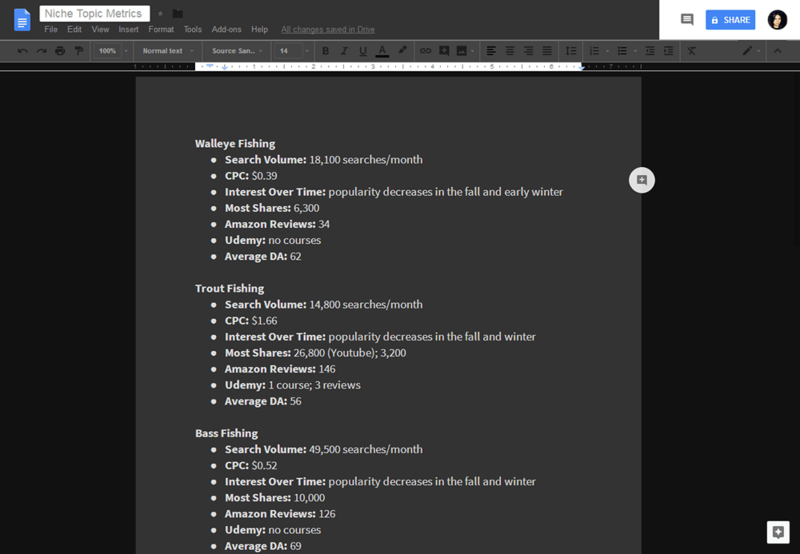 You can see I broke down my niche topics “ice fishing” and “fly fishing” even more to come up with the even more specialized topics of “walleye fishing,” “bass fishing” and “trout fishing.” Try to do the same with your niche topics. If you’re having trouble breaking down your niches, use a tool called Google Keyword Planner. You’ll need to logged into a Google account to use it. Enter a broad or first-level niche topic to generate a number of different keyword ideas, many of which can very well be blog niche ideas. Use each niche topic to generate new ideas. Once you have your mind map full of ideas, narrow the list down to a handful of ideas. Around 2-10 should be good. You can technically choose a niche from all of the brainstorming you’ve just done, but let’s dive a little deeper and research our niches to determine which one has the most potential to be profitable, which one is most popular and which one has the most competition. Let’s start with a tool called Keywords Everywhere. It’s a free browser extension you can add to Chrome or Firefox. It displays keyword metrics in a variety of different places, including Google. Install it in your browser, and use Google Search for each of your niche topics. 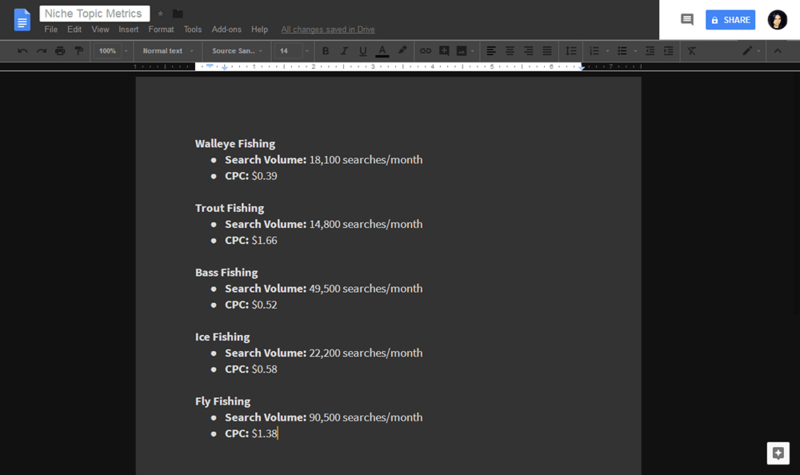 Record each search volume metric in a document, spreadsheet or child branch in Coggle. 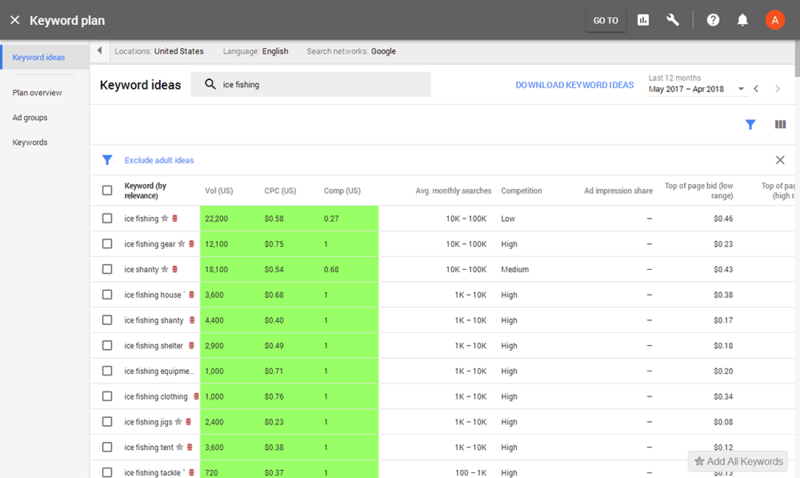 You can even record each CPC metric to keep a record of how much advertisers are paying for each niche topic. Next, view the popularity of your niche topic over time in Google Trends. Creating a blog about a topic that has only gained popularity in recent months is risky as the buzz will probably wear off soon, which means you’ll be stuck with no traffic. Starting a blog about a dying niche is risky as well. 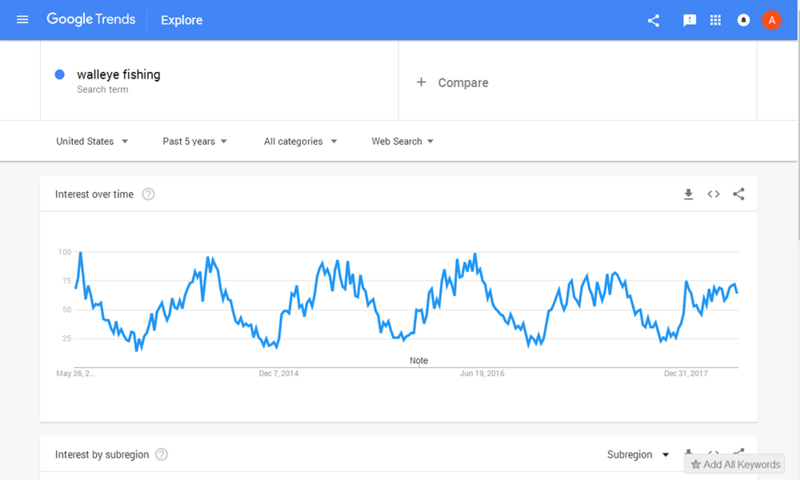 Look at your niche topic’s data in Google Trends, and make sure it’s maintained popularity over time. It doesn’t need to be much. It just needs to be consistent. 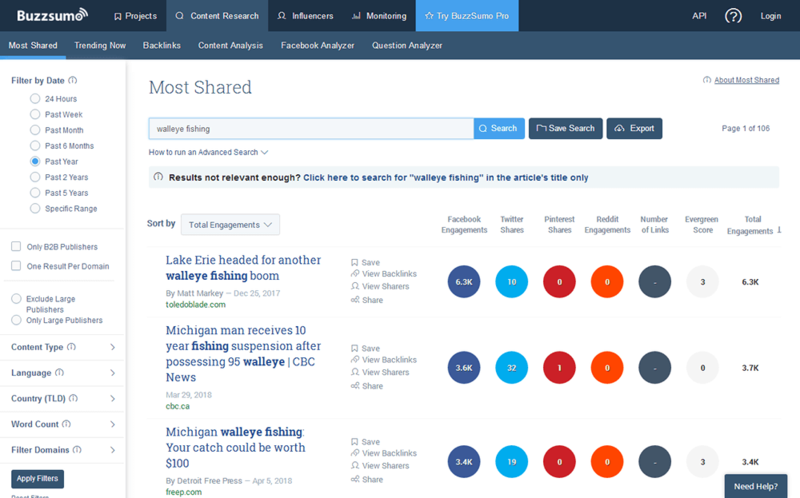 Record the most number of shares an article received for your niche topic (or top two if the first metric seems unusually high). Next, determine your niche topics’ sale potential by running it through Amazon and Udemy’s search engines. I recommend searching in the Books category in Amazon since books and courses are among the most popular products bloggers create. Make sure you change the sorting filter to Most Reviews, and record the most number of reviews a book has gotten for each topic. Again, record the second number if the first one seems unusually high. Do the same with Udemy. A lot of the tools that allow you to research the top sites in a particular niche limit the amount of searches you can do in a day and want to charge $49 or $99/month to view more. Because of this, I recommend creating a free account at Moz, installing the MozBar browser extension, and searching for each niche topic with Google. You’ll be shown two metrics for each website on the first page—Page Authority and Domain Authority. The second metric is what we’re concerned about here. The higher the domain authority, the harder it is to compete with a site in a particular niche. I recommend recording the average domain authority for the first page of every one of your niche topics. Round to the nearest whole number. I also recommend keeping YouTube’s metrics out of your results since these are video results from one of the world’s most popular sites. Also, your location will influence your results, but not by much usually. Let’s learn how to sift through it all. 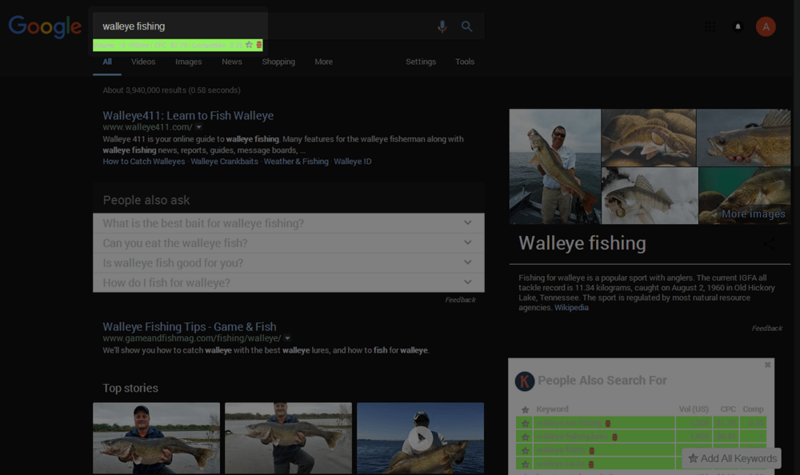 “Bass fishing” and “fly fishing” are by the far most popular topics in this niche based on search volume, social shares and sale potential. However, the average domain authorities for these topics came out to be 69 and 71, which are far too high for a new blog to compete, so they’re out. In my opinion, the best option out of the three remaining topics is “trout fishing.” It has the lowest search volume metric, but advertisers are paying more than twice as much for this keyword, and it has a lot of potential based on social shares and sale potential. Plus, the average domain authority for this keyword is 56, the lowest metric out of the topics in this list. Consider all of this when you try to narrow down your list to one blog niche. It is, however, important to note that you won’t need to focus on this niche forever. You just need to focus on it long enough to establish yourself as an authority and long enough to establish a consistent flow in revenue and traffic. Once you do that, you can start branching out and including more niches in your strategy. Once you find your blog niche, get to work on your blog. Start by setting up a hosting account with SiteGround, installing WordPress on your server and choosing a blog theme. More importantly, start researching the audience your niche is targeting, and find out what problems they’re having. Have direct conversations with them, see what they’re having problems with in forums and sites like Quora, converse with them in Facebook Groups, and read low-star product reviews in your blogging niche, such as the ones we searched for earlier on Amazon, to see what they’re still struggling with after reading a book. I agree finding the right blog niche is the most important thing before starting out. Hi Jeff. Glad you like it! Thanks for sharing it! © 2019 ThemeTrust All Rights Reserved.